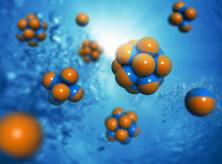 Complex liquids under flow are ubiquitous in nature and technology, ranging from the flow of blood in our bodies to the flow of surfactants in enhanced oil recovery. We are in particular interested in studying and designing microfluidic devices for sorting and separating colloidal particles based on their size and deformability. Such systems are especially important for biotechnological applications, for example protein purification, cell sorting, and early diagnosis of pathogenes. However, little is known about the underlying physics of complex systems under flow, impeding the design and fabrication of effective devices. Computer simulations play a substantial role in advancing this field, as they allow for microscopic insights and precise control over the system parameters, which is otherwise often challenging or even impossible in experiments. For more information, please contact Arash Nikoubashman . Confined macromolecules play an important role for a wide range of applications, such as the fabrication of nanoparticles for targeted drug delivery and for tailored nanomaterials. Further, these systems can give crucial insights into the inner workings of biological problems where confinement effects are crucial, such as the packaging of double-stranded DNA in bacteriophage capsids and the self-assembly of actin filaments in cells. 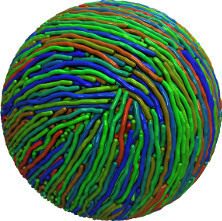 Our simulations have revealed a complex interplay between the packing and bending of semiflexible chains, which leads, for example, to nematic ordering in the sphere interior and the emergence of intricate topological defects on the sphere surface. For more information, contact Kurt Binder or Arash Nikoubashman.